Being a deaf student entails a number of challenges. Being a deaf student who has to fend for himself after the death of parents is a much more difficult challenge to overcome. ADVOCATE. As a deaf scholar, Juner Quiambao used his knowledge to teach Filipino Sign Language to public school teachers, students, and juvenile delinquents. But Juner Quiambao overcame the hurdles and finished his college degree. At the age of eight, Quiambao contracted German measles, a viral infection that left him deaf. Despite the permanent disability, he accepted it with the help of love and support from his parents, three brothers, and a stepbrother. However, just when the close-knit family started to recover, his mother succumbed to breast cancer. And within two years, his father had a fatal heart attack. The succeeding deaths of their parents left the siblings totally devastated—emotionally and financially. “We were absolutely clueless where to get money for rent and the piling up unpaid school fees,” he recalled. Quiambao, who was studying at the Philippine School for the Deaf then, had to take care of his school fees on top of the mounting expenses for basic existence. Knowing full well that they had to fend for themselves, he reached out to his best friend, Daniel, and asked if he knew of any work opportunities. “I told Daniel that I needed to work—to at least buy my own food,” he shared. Thankfully, Daniel’s parents hired Quiambao as a weekend household helper, in exchange for a few hundred pesos per day. While still trying to survive on a daily basis, the pursuit of continuing education became less of a priority and almost like a far-fetched dream. However, Quiambao’s teacher from PSD encouraged him to apply at the De La Salle-College of Saint Benilde. He immediately grabbed the opportunity and independently and secretly applied. Quiambao was blessed for he was not just accepted, but was also a recipient of a scholarship grant. “At PSD, it was easy to adjust as the whole school was dedicated for the deaf,” he noted. But things were different at Benilde—the deaf and the hard of hearing were mixed with the hearing. Instead of feeling intimidated, he soon adopted the college’s standard Filipino Sign Language. As a scholar, he made certain that he capped off the night by studying and maintained his grade requirements. Quiambao proudly holds a framed photo of his parents. However, come sophomore year, he had drained all his savings during his days as a house helper. “With no money, I planned to quit school. I was so depressed and so lost, I simply wanted to give up,” recalled Quiambao. Parents of Benildean associate Bea Francisco came to the rescue and supported him. Quiambao never met his scholastic guardian angels, though he exchanged letters and sent tokens of gratitude to them. With a newfound lease in life, Quiambao joined a number of associations which helped him relate with others and boosted his confidence. He became part of the Lasallian Ministry Program for the Deaf, the Silent Steps, SDEAS sports team, Saint Benilde Romançon Dance Company. 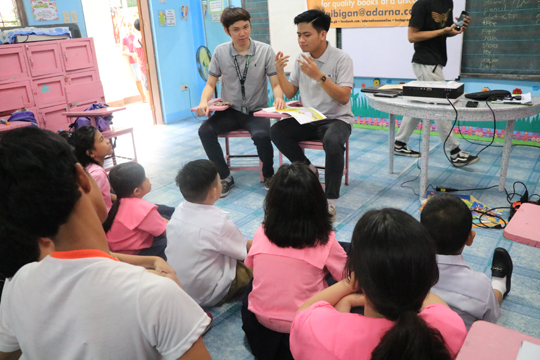 Further, as an active member of the Social Responsibility and Outreach Program, he volunteered to teach FSL to the public school teachers in Davao and to the juvenile delinquents at the Stairway Foundation, Inc. The scholar also brought his newfound advocacy to the performing stage when he played the role of Ding, Darna’s deaf brother, in the college’s recent musical Ding! Ang Bato. Also currently nominated for the Gawad Benildyano Award, Quiambao’s efforts, dedication, and achievements continue to reflect in the impact he has left both in the deaf and hearing community. “There are so many opportunities here. Everyone around you propels you to achieve your dreams. They do not only teach us academically, but also teach us not to give up, and most importantly how to serve. Because of Benilde professors and students, I did not give up,” enthused Quiambao. 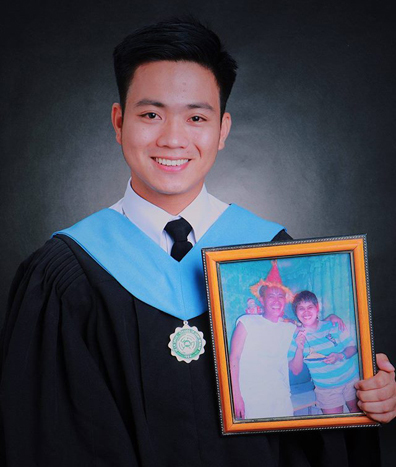 Quiambao overcame his hurdles with the help of his family, friends, professors, and, most importantly, his drive to achieve his dreams and help more people around him. Recently, Quiambao’s siblings witnessed him march on the stage of the Philippine International Convention Center to receive his diploma in Bachelor in Applied Deaf Studies-Business Entrepreneurship. “Right after the ceremony, we visited the graves of our parents to show my diploma, lighted candles, and kissed their portraits,” he shared.